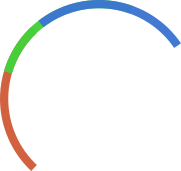 How do I create a tri-colored arc in Inkscape? I need to cut an arc which has three colors say red, green and blue one after the other. This is for a circular game paddle. 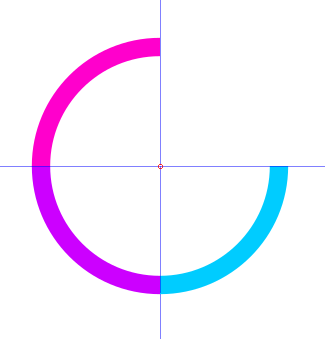 I am using a differentiate on a square and a circle, then rotating the entire thing and deleting the longer arc-path and changing the color of the smaller-arc. Is there a simpler and more efficient method to create a tri-color arc? Now I need to make each section of the arc uniform. I want easy ways to use angle or specify size percent. 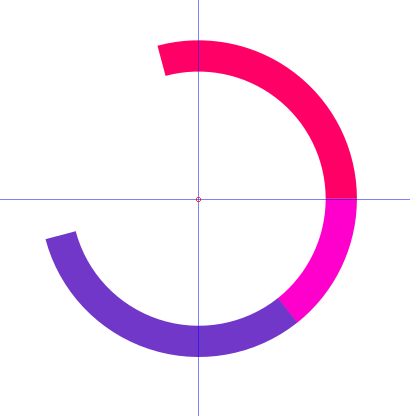 With the circle tool and circle still selected, you can calculate the arc length you desire by expressing it as a percentage fraction X 360. i.e. 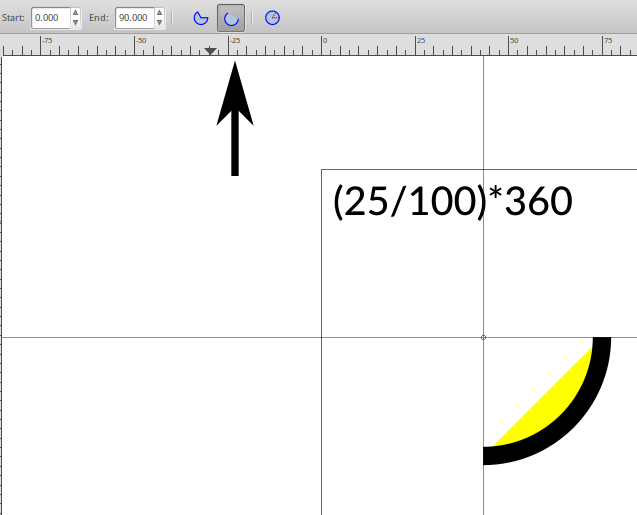 (25/100)*360 can be typed directly into the "End" box to give you 25% arc length which is 90 degrees. Note: the brackets are important. Make sure you click "Switch to arc" after you calculate the arc size. 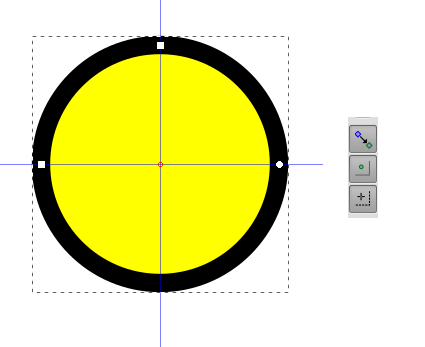 With the Selection tool, click the rotation point and move it to the guide intersection. We want to rotate and duplicate the arc around this point. Clone the arc with Alt+D, and click the arc layer again to make the rotation handles appear. Use the selection tool to rotate the arc around the pivot point, and press SPACEBAR to clone/stamp the arc around this point. Select all clones and Shift+Alt+D to unlink clones. You can now remove any fills and enter the arc stroke colours as you wish. For different arc lengths: After you Unlink your arc clones, you can enter different values into the "End" box (whilst the circle tool is selected) for each arc. Make sure you move the centrepoints of the arcs into the intersecting guides & rotate each arc to join them together. Not the answer you're looking for? 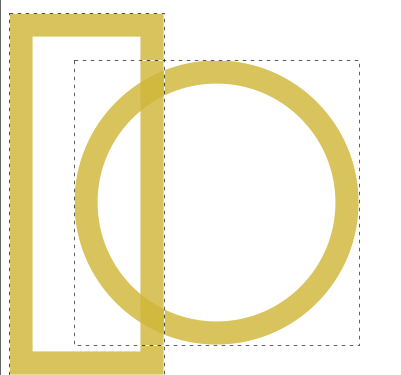 Browse other questions tagged inkscape shapes data-visualisation or ask your own question. How do I create new objects from existing nodes in Inkscape? Inkscape: how to create a polygon from several polylines? how to create a different colored compound path in illustrator? Inkscape: Add 90°-lines around arc? 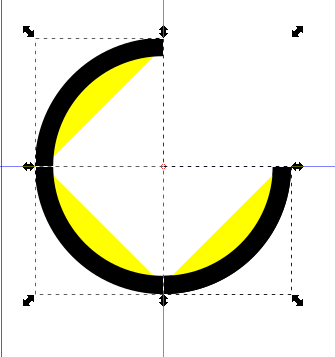 Inkscape - How to cut lines across an arc? How do you create Arc/Rainbow Charts?